Efforts in 1975 to capture the lessons of Vietnam as a guide to future policy died in the National Security Council with the seizure of the SS Mayaguez. Note the “OBE” (Overtaken By Events) scrawled over this cover sheet. Henry Kissinger did not initial it, and there is no indication that President Gerald Ford saw the memo. America’s efforts to define the “lessons of Vietnam” started during the war, and have continued ever since, with no apparent progress toward consensus. As the terrible climax of the war arrived in April and May 1975, it seemed a natural moment to capture these lessons as a guide to future policy. Accordingly, Secretary of State and National Security Advisor Henry Kissinger directed the National Security Council staff to formulate the lessons from the war, with input from the Department of State. The paper went to the NSC, where it ran afoul of a staff review by Richard Smyser and Bill Stearman. 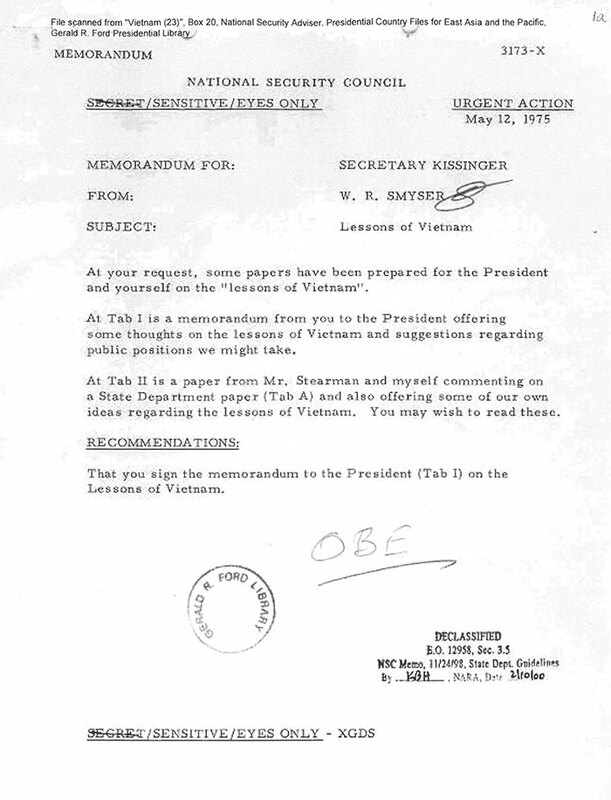 Their review, forwarded to Kissinger, took issue with the most basic assumption of the State Department draft: that there were useful lessons to be learned from Vietnam. The NSC considered Vietnam “a unique situation, geographically, ethnically, politically, militarily and diplomatically,” summarizing their view that “the war had almost universal effects but did not provide a universal catechism.” The NSC went on to a point-by-point critique of the State Department’s draft, in nearly all cases focusing on the difficulty of applying general precepts in a particular situation. 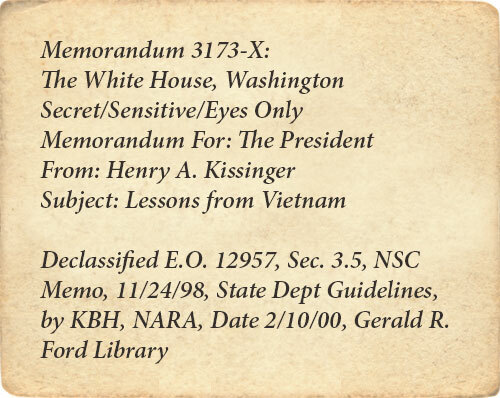 The NSC staff nonetheless went on to offer several guidelines and lessons of their own, and forwarded their own draft to Kissinger. The action stalled at that point, and nothing was ever forwarded to the White House. The tumult of the Mayaguez incident, involving the seizure of the SS Mayaguez by Khmer Rouge forces, preempted the attention of the entire interagency policy community, and the “lessons learned” process halted there—a circled “OBE” (Overtaken By Events) scrawled across the cover memo. At about the same time, an apparently unrelated analysis of the Vietnam experience was produced by the Joint Chiefs of Staff. That document was published in Foreign Relations of the United States, 1969-1976, Volume X, Vietnam, January 1973– July 1975. That volume also contains both the State Department memo and the NSC draft for Henry Kissinger that are reproduced in the following pages. Notably, none of these informed and thoughtful contemporary analyses attribute the loss of South Vietnam to the media, which in the years since seems to have taken on a major role in the nation’s popular memory. All remain well worth reading, despite the passage of four decades and all the hard-won experience gained in the intervening wars. From the standpoint of State Department FSOs, the lessons to be learned from the Vietnam experience were numerous and clear. To draw meaningful lessons from our Vietnam experience it is essential to bear in mind the climate of the times during which fateful decisions were taken. In 1954 it was widely accepted that we faced a monolithic communist bloc bent on expansion through military means. Indochina was seen with considerable logic in that context, as a primary locus for that expansion and there was a remarkably broad consensus in this country that the United States should combat it. In the early 1960s, America was imbued with an activist, outward-looking spirit, one reflection of which was the notion that American resources and American expertise could solve any problem anywhere. It was only in the late 1960s, when our participation in what was perceived to be an unjust and unwinnable war became objectionable to broad segments of the American people, that our policies outstripped the national consensus and support for them began to wane. • We must keep commitments to individual countries tailored to our degree of interest. This is not to say that the independence and well-being of small countries are of no consequence or concern for the United States—only that such considerations are relatively more consequential in areas where our interests are more directly at issue. Related to this, resources devoted to carrying out our commitments should be proportionate to the intrinsic importance of the commitment itself, or of the interest it reflects. • Recognizing that constancy in our commitments is important, we should nevertheless avoid confusing constancy with inertia. When circumstances change dramatically, or a commitment clearly becomes unsustainable, we should draw the right conclusions and change our policy accordingly. 1968 was probably a better time to try for a comprehensive political settlement in Vietnam than was 1972. 1973 was a better time to press the GVN [South Vietnamese government] for further realistic political negotiations—particularly since we were in that year deprived by Congress of the ability to enforce the Paris Agreement— than was 1974 or 1975. • Foremost among the criteria we might henceforth employ in making judgments about our commitments is the indigenous strength and will of our prospective ally—its ability to help itself. Although the Vietnamese government we supported was far more humane than its adversary, it was, in the final analysis, unable to mobilize effectively the support of its people in the face of an implacable, disciplined enemy. Without such support, ultimate defeat was probably inevitable. In our desire to stem North Vietnamese communist expansion, we underestimated this critical factor. • In effect, we allowed saving South Vietnam to become more important to us than it was for the South Vietnamese themselves. In the future, we should gauge our support to our allies’ efforts, and their successes. If they cannot do the job, we will be unable to do it for them. It’s a good memo, the sort of thing we might have done well to read carefully before our latest adventure in the Middle East. • We should be fully aware of the fragility of governments which rest, to a significant degree, on the support of the military. This was not the chief cause of South Vietnam’s downfall— indeed the GVN retained a considerable aura of legitimacy within Vietnam—but the inflexibility and narrowness of judgment of an increasingly isolated leadership in the face of unyielding North Vietnamese pressure played a role in the nation’s ultimate collapse. • We consistently allowed the GVN to utilize massive U.S. support as a substitute for solutions to its own internal political problems. We were never willing to force the GVN to face up to this fact. • There are probably few prospective opponents anywhere in the world who will prove to have the determination and single-mindedness of Hanoi. Nevertheless, we consistently underestimated the tenacity and sense of purpose of Hanoi, and overestimated our ability to break its will. We applied our strength without an adequate assessment of our opponent and thus neither achieved success nor deterred his pursuit of his objectives. • Nor should we underestimate the ability of revolutionary movements to develop broad and deep-seated popular support in loosely structured, unmodern societies. Most such societies have relatively recent memories of colonialism, or continue to experience various degrees of external exploitation, and are as such susceptible to revolutionary appeals to nationalistic instincts. In Vietnam, we were never able to escape being the inheritors of the French colonization. • Clearly, Vietnam demonstrated that the effectiveness of modern military technology is severely limited in unconventional conflicts. Neither massive firepower, nor ingenious gimmickry, can insure [sic] success. Their selective use, on a piecemeal basis, adds to their ineffectiveness. • In addition, if we ever again undertake a direct military involvement in such a conflict, we should guard against shifting from a supportive to a primary role, as we did in Vietnam beginning in 1965. • Moreover, we should avoid situations such as developed in Vietnam in which the indigenous defending forces became second-class citizens in their own country; as our own military role grew, ARVN’s [the South Vietnamese Army’s] declined, a situation which was not reversed until we began Vietnamization and the withdrawal of our forces. • We should recognize that large expeditionary forces, by their very nature, will not adapt to the conditions of an unconventional conflict. Instead, the tendency will be to transform an unconventional war to a conventional one, while fundamental political aspects of the conflict are progressively ignored. • We should admit our own imperfect understanding of the political dynamics of foreign (particularly Asian) societies. In Vietnam we persistently looked at political conditions, and made our judgments from what was basically a Western perspective. • Since our ability to understand the politics of countries such as Vietnam is limited, it follows that our attempts to manipulate political forces may well fail. We should not assume, as we did in 1963, that we know what is best for a country and proceed, as in the overthrow of [President Ngo Dinh] Diem, to precipitate a situation with unknown and possibly disastrous consequences. Nor should we take the opposite tack—allying ourselves too rigidly with a leadership whose diminishing mandate we may not be able to perceive. • We should more realistically assess our ability to maintain international support for difficult undertakings, recognizing at the outset that we may be operating alone, that other governments— because of limited resources, differing political perceptions or divergent national interests—will not support our efforts in any meaningful way. Through strenuous efforts we elicited some tangible support from a few of our friends for our policies in Vietnam but this was not sustained. • Moreover, we should bear in mind the possibility of undertakings such as Vietnam actively damaging our relations with other allies. • We should not expect, in the event of another situation like Vietnam, that the major communist powers will help pull our chestnuts out of the fire. At best, our bilateral relationships with the PRC [Peoples Republic of China] and the Soviet Union may encourage a passive response from them—whether things are going well for us (as in 1972), or badly (as in 1975). • We should expect that the major communist powers will support local subversion and wars of liberation, particularly if they perceive no adverse effect on their relations with us or on their direct interests. We should be fully aware of the fragility of governments which rest, to a significant degree, on the support of the military. • If we were ever to become involved again in an effort of the magnitude of Vietnam, we could make things somewhat easier for ourselves by improving the ways we attempt to manage our involvement. It can be argued that, in addition to having very little control over what South Vietnam did, we were never in firm control of our own resources, whether military, economic or political. A diffusion of responsibility and control compounded our difficulties. • We should guard against biased intelligence and analysis to support policy goals, as happened in Vietnam particularly during the height of our involvement. Related to this, we should be wary of “advocacy reporting” from our missions and within the bureaucracy at home. A particularly virulent form of “localitis” affected many capable and dedicated individuals working in or on Vietnam. They were intensely committed to a worthy goal, but personal commitment sometimes blurred judgment. • We should devise more effective ways of bridging the gap between the expert level and the decision-making level of the government. Cogent judgment was often obscured as information and recommendations proceeded upward through the system, because of the pressures for success. • We should insure [sic] that the political and military aspects of our commitments, and the resources we devote to each, are kept in proper balance. Military considerations will become dominant in policy if that balance is skewed and, as in Vietnam, we may lose sight of the fundamental nature of the conflict and our goals in it. • We should try to insure [sic] that we do not become locked in to “firefighting” management techniques. We must improve our ability to anticipate events in any situation of major American involvement, rather than finding ourselves—as we so often did in Vietnam—coping with crises after they had arisen. • We should recognize that no amount of cajolery can create public support for a foreign undertaking where none already exists. (Thus, our commitments must be related to perceived national interests.) An administration, by active leadership, can only energize latent support. • Having become involved in a difficult foreign project, we should not attempt to mislead public opinion or the Congress as to its duration or the level of sacrifice it will require. We should not profess to see lights at the ends of tunnels. We should not employ short-term rationales, out of short-term expediency, when in fact much remains to be done. • We should never assume that inconsistencies in our policies, or foul-ups in their implementation, will go unnoticed by the fourth estate. We will have to live with the fact that mistakes will be exposed (as well as, unfortunately, the fact that any course of action, right or wrong, will be second-guessed). • We should insure [sic] that Congress is on board not only at the outset of foreign commitments, but at every stage at which any escalation of our commitment or involvement is contemplated. In the absence of congressional support, clearly, commitment beyond a certain level is impossible. • Consistent with the requirements of military security, our basic policy decisions should be publicly stated and defended. In National Security Advisor Henry Kissinger’s view, Vietnam offered very few lessons that could be usefully applied elsewhere. 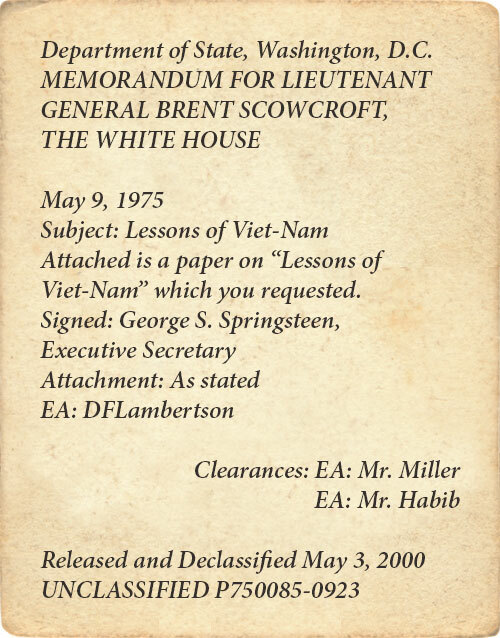 At your request, I have prepared some thoughts on the “lessons of Vietnam” for your consideration and for your background information in dealing with further press questions on the subject. The real frustration of Vietnam, in terms of commentary and evaluation, may be that the war had almost universal effects but did not provide a universal catechism. A frequent temptation of many commentators has been to draw conclusions regarding the tenacity of the American people and the ultimate failure of our will. But I question whether we can accept that conclusion. It was the longest war in American history, the most distant, the least obviously relevant to our nation’s immediate concerns, and yet the American people supported our involvement and its general objectives until the very end. The people made enormous sacrifices. I am convinced that, even at the end, they would have been prepared to support a policy that would have saved South Vietnam if such an option had been available to use. It must not be forgotten that the decisions of American administrations that involved this nation in the war were generally supported at the time they were taken, and that they were supported not only among the people at large but among the political elements and among the journalists who later came to oppose the war. The American people generally supported and applauded President Eisenhower for a decision to partition Vietnam and to support an anti-Communist government in the South. The American people, and particularly the American media, supported President Kennedy’s decision to go beyond the restrictions on American involvement that President Eisenhower had set and they also supported his decision to permit American involvement in the removal of President Diem—although the extent of that involvement was not clear at the time. Many who were later to be labeled as “doves” on Vietnam then insisted that South Vietnam had to be saved and that President Diem’s removal was essential to save it. You, yourself, will remember the strong support that the Tonkin Gulf resolution won on the Hill and the general support for President Johnson’s decision to send troops. President Nixon won an outpouring of support for the decision to withdraw American forces at a gradual pace, as well as for the Paris Peace Agreement. If one could offer any guidelines for the future about the lessons to be drawn regarding domestic support for foreign policy, it would be that American political groups will not long remain comfortable in positions that go against their traditional attitudes. The liberal Democrats could not long support a war against a revolutionary movement, no matter how reactionary the domestic tactics of that movement. They had accepted the heavy commitment to Vietnam because of President Kennedy, whom they regarded as their leader, but they withdrew from it under President Johnson. One clear lesson that can be drawn, however, is the importance of absolute honesty and objectivity in all reporting, within and from the government, as well as from the press. U.S. official reports tended for a long time to be excessively optimistic, with the result that official statements did not make clear to the American people how long and how tough the conflict might turn out to be. After a while the pessimistic reports from journalists began to gain greater credence because such positive trends as did emerge came too slowly to justify optimistic Washington assessments. In Vietnam, the situation was generally worse than some reported and better than others reported. But the pessimistic reports, even if they were inaccurate, began to look closer to the mark until almost any government statement could be rejected as biased, not only by the opposition but by an increasingly skeptical public. Another lesson would be the absolute importance of focusing our own remarks and the public debate on essentials—even if those essentials are not clearly visible every night on the television screen. The Vietnam debate often turned into a fascination with issues that were, at best, peripheral. The “tiger cages” were seen as a symbol of South Vietnamese government oppression, although that government was facing an enemy who had assassinated, tortured and jailed an infinitely greater number; the “Phoenix” program became a subject of attack although North Vietnamese and Viet Cong tactics were infinitely more brutal. The My Lai incident tarnished the image of an American army that had generally—though not always—been compassionate in dealing with the civilian population. Even at the end, much of the public discussion focused on President Thieu’s alleged failure to gain political support, but it was the communists who rejected free elections and who brought in their reserve divisions because they did not have popular support. And at home, it was argued that your aid request meant American reinvolvement when nothing was further from your mind. Vietnam represented a unique situation, geographically, ethnically, politically, militarily and diplomatically. Of equal importance may be a dedication to consistency. When the United States entered the war during the 1960s, it did so with excesses that not only ended the career and the life of an allied leader but that may have done serious damage to the American economy and that poured over half a million soldiers into a country where we never had more than 100,000 who were actually fighting. At the end, the excesses in the other direction made it impossible to get from the Congress only about 2 or 3 percent as much money as it had earlier appropriated every year. When we entered, many did so in the name of morality. But nobody spoke of the morality of consistency, or of this virtue of seeing something through once its cost had been reduced to manageable proportions. In terms of military tactics, we cannot help [but] draw the conclusion that our armed forces are not suited to this kind of war. Even the Special Forces who had been designed for it could not prevail. This was partly because of the nature of the conflict. It was both a revolutionary war fought at knife-point during the night within the villages. It was also a main force war in which technology could make a genuine difference. Both sides had trouble devising tactics that would be suitable for each type of warfare. But we and the South Vietnamese had more difficulty with this than the other side. We also had trouble with excesses here: when we made it “our war,” we would not let the South Vietnamese fight it; when it again became “their war,” we would not help them fight it. Ironically, we prepared the South Vietnamese for main force warfare after 1954 (anticipating another Korean-type attack), and they faced a political war; they had prepared themselves for political warfare after 1973, only to be faced with a main force invasion 20 years after it had been expected. Our diplomacy also suffered in the process, and it may take us some time to bring things back to balance. We often found that the United States could not sustain a diplomatic position for more than a few weeks or months before it came under attack from the same political elements that had often advocated that very position. We ended up negotiating with ourselves, constantly offering concession after concession while the North Vietnamese changed nothing in the diplomatic objectives and very little in their diplomatic positions. It was only in secret diplomacy that we could hold anything approaching a genuine dialogue, and even then the North Vietnamese could keep us under constant public pressure. Our diplomacy often degenerated into frantic efforts to find formulas that would evoke momentary support and would gloss over obvious differences between ourselves and the North Vietnamese. The legacy of this remains to haunt us, making it difficult for us to sustain a diplomatic position for any length of time, no matter how obdurate the enemy, without becoming subject to domestic attack. In the end, we must ask ourselves whether it was all worth it, or at least what benefits we did gain. I believe the benefits were many, though they have long been ignored, and I fear that we will only now begin to realize how much we need to shore up our positions elsewhere once our position in Vietnam is lost. We may be compelled to support other situations much more strongly in order to repair the damage and to take tougher stands in order to make others believe in us again. I have always believed, as have many observers, that our decision to save South Vietnam in 1965 prevented Indonesia from falling to communism and probably preserved the American presence in Asia. This not only means that we kept our troops. It also means that we kept our economic presence as well as our political influence, and that our friends—including Japan—did not feel that they had to provide for their own defense. When we consider the impact of what is now happening, it is worth remembering how much greater the impact would have been 10 years ago when the communist movement was still widely regarded as a monolith destined to engulf us all. Therefore, in our public statements I believe [that] we can honorably avoid self-flagellation and that we should not characterize our role in the conflict as a disgraceful disaster. I believe our efforts, militarily, diplomatically and politically, were not in vain. We paid a high price, but we gained 10 years of time and we changed what then appeared to be an overwhelming momentum. I do not believe our soldiers or our people need to be ashamed. Stephen Randolph serves as the historian of the U.S. Department of State. A 1974 graduate of the United States Air Force Academy, he served for 27 years on active duty in the Air Force, retiring as a colonel in 2001. He flew F-4s and F-15s, with a tour in Operation Desert Storm; held senior staff positions on the Joint Staff and the Air Staff; and then joined the faculty at the National Defense University, serving for 15 years before moving to the State Department in 2011. He earned a master’s degree in the history of science from The Johns Hopkins University in 1975 and a doctorate in history from The George Washington University in 2005. He is the author of Powerful and Brutal Weapons: Nixon, Kissinger, and the Easter Offensive (Harvard University Press, 2007).